They say if you drink from the Nile, you’re destined to return to Egypt. I traveled to Cairo this winter, uncertain of what to expect upon my arrival. Soon enough, I met the city’s dusty, traffic-filled streets – reminding me of my parents’ Pakistan. Like Peshawar, Cairo’s every hour is rush hour, its sun holds on to your skin, and its nights last until the tea runs out – which always seems to be brewing. 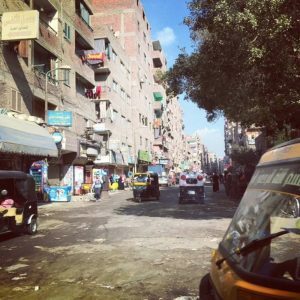 As colorful rickshaws drive past the continuous stream of pedestrians, the everyday rush in Cairo seems impossible to disrupt. But six years earlier, these same streets were home to marches, occupations and violent clashes between police and protestors. For those of us who watched the revolution through a TV screen, we relied on images to convey the story that the Egyptian people wanted the world to hear. It was a story of passion, resilience, and a relentless desire for freedom. I recall one image that evoked in me a sense of anger and empathy; it was that of a woman in Tahrir Square being dragged by helmeted military officers, her black robe unbuttoned, revealing a bare torso and bright blue bra. This image exposed authorities’ abuse of power to an international audience – and quickly emerged as a rallying symbol for female protestors to affirm their place and purpose in the revolution. However, the military was not the sole instigator of violence against women in Tahrir Square. In the cycle of protests and celebrations, as one leader was ousted after the other, sexual harassment remained rampant. Indeed, a 2013 study from UN Women revealed that 99.3 percent of women in Egypt faced sexual harassment in their lifetime. In the protests against Mohamed Morsi, at least 169 counts of sexual mob crime were recorded. The actual number of crimes is likely much higher, as many women do not report sexual harassment due to fear, lack of access to or mistrust of authorities, or acceptance of the crime. Despite this stark reality and increased government crackdown on civil society and human rights groups, the fervent passion that sparked the revolution is not lost; rather, it has just been reoriented. A generation of young leaders, activists and practitioners is committed to seeing social change in their country, and I was fortunate enough to meet with some of them. My trip to Egypt was organized by Hands Along the Nile Development Services (HANDS) through the State Department Professional Fellows Program. Every year, HANDS places young professionals from Egypt, Morocco, and Tunisia with US-based organizations, like ICRW, for one month. As part of a return exchange, members of the host organizations visit the fellows in their home country. Throughout my stay, I met with emerging leaders and organizations committed to a wide array of social causes. One of these organizations was HarassMap, a volunteer-based initiative that collects reports of sexual harassment and records them on an interactive online map. HarassMap then uses this data in its communications campaigns to raise awareness about the problem and encourage positive action. I also met with Egypt’s future leaders at the Nashaat 17 Girl Friendly School in the Badrasheen district of Giza. This colorful community school is one of 201 one-room school buildings constructed by Springboard, a nonprofit organization established by Apache Corporation, as part of the Girls’ Education Initiative (GEI). 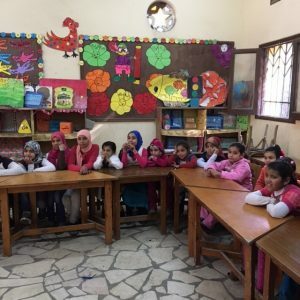 This initiative, launched in 2003 by Egypt’s National Council on Childhood and Motherhood (NCCM), aims to increase girls’ access to education by building classrooms in rural communities that are distant from public education institutions. When public schools are too far, many families are deterred from sending their daughters to school for fear of safety (due to problems like public sexual harassment) and lack of economic resources, on top of social norms that may lead parents to consider girls’ education as unnecessary or superfluous. To ensure that the establishment of these schools is not perceived as outsider intervention, the GEI encourages community “buy-in” and participation. While NCCM’s funding partners, such as Apache Corporation, cover costs, communities must donate land and volunteers for the schools’ sustainability. In addition to being completely free, these one-room schools are designed to be “girl-friendly”; they are staffed with female facilitators from the same or nearby communities and adhere to a schedule that permits girls to carry on their household duties – allaying the concerns of families that rely on their daughters’ contributions to the home. Classroom activities include cooperative learning, self-education, presentations, games and physical sports. While community one-room schools increase girls’ access to education, UNICEF’s 2014 report on out-of-school children in Egypt reveals that 11.1 percent of girls aged 5-14 are not enrolled in schools, compared to 10.9 percent of boys. This gap increases between ages 6-10 and 11-14, reflecting the transition, or lack thereof, between primary and preparatory school attendance. The students at Nashaat 17 Girl Friendly School were confident and eager to learn. They proudly proclaimed their aspirations to be doctors and engineers, and the excitement and affection with which they greeted us made our language barrier nearly unnoticeable. While civil society and human rights defenders face increased government repression – even the threat of prosecution – I hope the existing work of organizations like Springboard and HarassMap helps Egypt’s youth take their future into their own hands – educated, skilled, and willing to defend their rights. When the Nile brings me back, whenever that may be, I long to witness the social change that its emerging leaders are working so hard to achieve.